Memento Mori On the Web: What Happens When Photos are Digitized? December 1, 2010 June 6, 2011 2 Comments on Memento Mori On the Web: What Happens When Photos are Digitized? Does anything about this photo seem unusual? It looks like a typical family photo from the Victorian era. What if I told you the woman in the middle was dead when the photo was taken? Did that change your reaction to the photo? I came across post-mortem photography a few years ago and became fascinated with it. As I began searching for images and histories of these photos, I was led to several websites and digital collections dedicated to the display of these photographs. It was during my research that I noticed a pattern; many of the same photos were being used on different websites. I remember my first reaction to these photographs. Such images made me very uncomfortable. Yet, how we view and deal with death and deceased bodies today is much different from the Victorian era. Today, death for the most part is a private affair and is not something we are exposed to on a regular basis. Post-mortem photography was common in the Victorian era after the invention of the daguerreotype in 1839. It was an affordable and suitable method for middle-class families to commemorate a loved one. Bodies were usually staged as though the deceased were still alive or in a deep sleep and it is rare to see the deceased displayed in a coffin or funerary setting. We must keep in mind that the meanings of photographs can change depending on who owns, exhibits, or contextualizes them. As time passes and as photographs move from one owner (this can be a personal or private collection) to another, the original meaning of the photo can be lost as various layers of interpretation and context shroud it. For instance, this photo has been digitized and displayed on Wikipedia along with countless other websites. To post it on my blog I simply made a copy of it and uploaded it into the post. This photo was copied thousands of times, and as Walter Benjamin would say, the status and meaning of this photo changed during this process. But photos as objects have histories – and how they are classified and given meaning throughout time can tell us a lot about ourselves and the way we view the past. Who owns this photo? Who took the photo? Who is the deceased woman in this picture? Are those her parents? I doubt we will ever know. Post-mortem photography has been exoticized on the internet. These pictures have become a commodity today; you can purchase some here. It is fascinating to see these photos, but keep in mind that their original meaning (as private objects of mourning) is reconceptualized on certain parts of the web, showcased as being scandalous, morbid, and at times, strange. How are we ‘seeing’ post-mortem photos through the gaze of showcasing websites? Other questions to keep in mind are: is that how the original photo looked? Or did the process of digitization detract from its original appearance? Was it cropped? Altered in any way? Can we trace this? 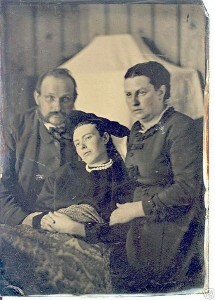 Looking at Victorian post-mortem photography on the web highlights some of the issues with the digitization of photos. The original photo as object is an artefact from the Victorian era and its material nature was lost after it was digitized. I wonder about its materiality; was it in a photo album along with other photos of loved ones, dead or alive? Was it framed? And if so, what did the frame look like? Was there a caption written behind the photo? As Joanna Sassoon argues, with the loss of materiality comes a loss of context. When digitizing photos we must be aware of this process. Kaleigh Bradley is completing her M.A. in Public History at Carleton University and is the research assistant for the Carleton Centre for Public History. Her research explores social memory, place, and photography in Northern Labrador.